Ten years on from the death of Harold Pinter, the theatre that bears his name is taking on quite the endeavour: performing all 20 of his short plays in one season. Here, I review Pinter Four: Moonlight and Night School. Amongst the fineries acquired over a prosperous life, amidst the comfort of his bedclothes but noticeably bereft of his children – Andy is dying. 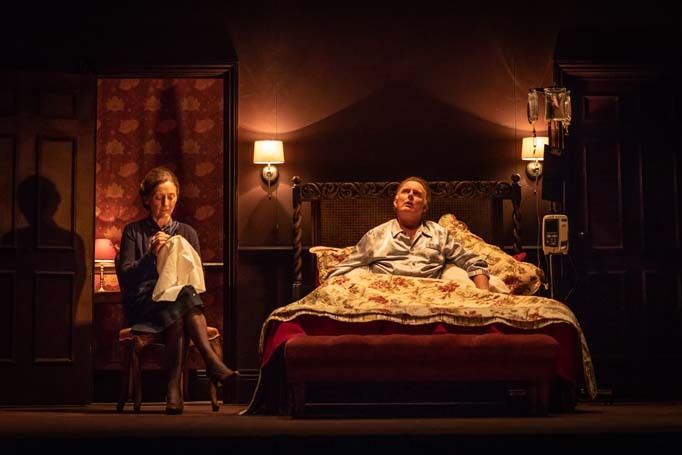 Robustly portrayed by Robert Glenister, Andy trades light-hearted shots at his wife, Bel, as she aloofly performs domestic chores and so, through witty retorts and riposte, Pinter tells the story of a marriage that has seen love, betrayal and companionship. In an effective twist, Moonlight director Lyndsey Turner rides roughshod over Pinter’s instruction to perform the scenes between Andy and his son Fred’s bedrooms – instead overlaying the action of his sons’ exchanges into Andy’s sleeping moments. As they spar over the meaningless names of business partners – constantly confusing one another – they draw clothing from their father’s wardrobe, whilst his moribund frame lies centre-stage and unacknowledged. The staging drives home the elephant in the room: the boys chat easily about not knowing their acquaintances but cannot bear to discuss their relationship with their own father. There are fine performances from Bríd Brennan, austere and sharp as Bel, and from the haunting, ephemeral appearances of Bridget (Isis Hainsworth). Moonlight is quick and does well to distract the audience with levity and wit but the way in which even close family members utterly fail to connect with each other, let alone bear to acknowledge one another’s mortality, is brought home perfectly in the heart-aching ‘Chinese Laundry?’ scene. Where in Moonlight we were met with a busy domestic arena, Ed Stambollouian’s Night School grabs our attention with the sheer sparsity of set on show. A revolve, a drum kit and a smiling Jessica Barden (The End of the F***ing World) greet us after the interval and offer a marked change in tone. Walter returns home from prison to find that his aunts have let his childhood room to a school teacher, and he isn’t happy about it. The piece has a pace to it that keeps the audience on our toes. Moments of tension are underscored and amplified by the live drumming – which keeps the play fresh whilst subtly foreshadowing one of the play’s central lies. Whilst the inability to truly know another person remains a core theme – aptly connecting the evening’s two offerings – Night School is chiefly memorable for its humour. On more than one occasion the cast must wait for laughter to subside as innuendo is brought out but the comediennes-in-chief are the two aunts, played hilariously by Brennan and Janie Dee. Their camped-up, bed-lit scenes are wonderful fun and include enough mentions of various salted fish to have me howling. Elsewhere, moments of humour are regularly found and never overlooked. It might be that this distracts from the more insidious, albeit a little thin, plot of the piece (which plays second-fiddle) but it is refreshing after the more serious, ‘intellectual’ Pinter that came before.